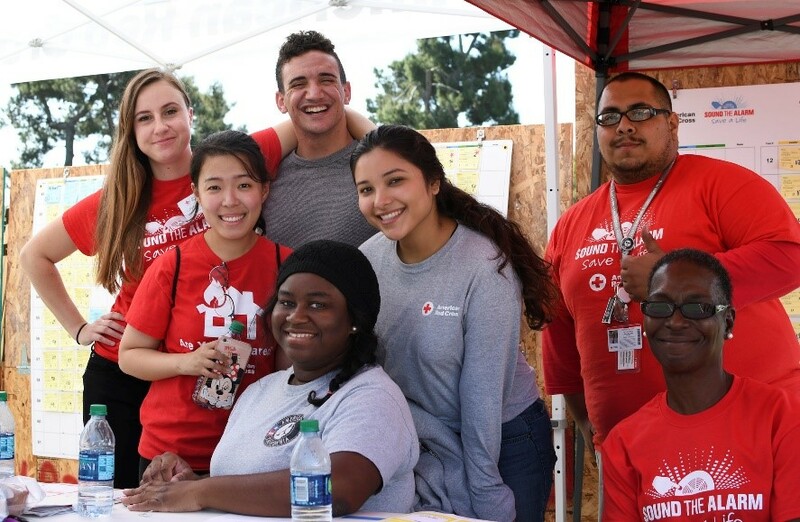 In the fall of 2017, at the request of our national office, the American Red Cross Los Angeles Region convened a region-wide committee focused on diversity and inclusion. We were happy to do so—because diversity and inclusion, in Los Angeles, is our strength. One question from the Landscape Analysis: Does ARC make sufficient efforts to reach diverse communities with our preparedness, response, and recovery programs? I got started. First, I needed to identify a chair for the committee from the Regional Board of Directors. Our board is diverse—representing a variety of areas of the county, a range of professions and, of course, a variety of races and ethnicities. But, one board member had over a decade of professional experience focusing on these issues. Fortunately, he said “yes.” Thanks, Vincent Jones! Vincent’s first act as chair was to work with me in developing a landscape analysis-type survey which would tell us a bit about the region’s attitudes on these subjects. All staff, volunteers and board members were invited to complete the survey. Over 150 completed all eight questions—and provided us with important information about areas of focus. One immediate area was the expansion of our focus from “diversity and inclusion” to add “equity.” First suggested by Vincent, “equity” is defined by Independent Sector as the fair treatment, access, opportunity, and advancement for all people, while at the same time striving to identify and eliminate barriers that have prevented the full participation of some groups. This “barrier elimination” focus seemed consistent with our goal, particularly as we considered our clients. Many, like victims of disasters, are in their worst moments—but also starting out with a couple of strikes already against them. After this initial effort, we were ready to invite our community members to join us. The criteria were straightforward. All those expressing interest were invited to join. After our first meeting—which had greater attendance—on September 26, 2017, the group settled down to a comfortable size of around 12 people, including board members (1 regional, 2 chapter), volunteers (4), staff (4) and AmeriCorps (1). At that time, we agreed as a group to a process that met the timeline and criteria from our national office, and added our own criteria—that all goals be S.M.A.R.T. goals: specific, measurable, achievable, relevant and time-limited. 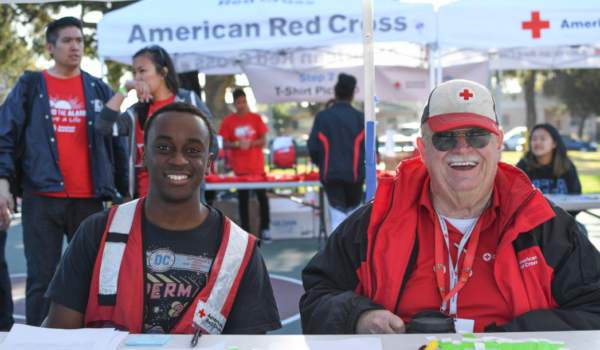 Assesses the LA Red Cross staff, volunteers, and community members to determine the individual, social, and community demographic diversity (i.e. age, race, religion, median household income, preferred language) using a mix of survey tools, Red Cross data sets such as Volunteer Connection, and other, publicly-available resources. Conducting an analysis of LA Red Cross engagement practices and services to identify areas of strengths, weaknesses, opportunities, and threats in each of the defined Los Angeles Red Cross geographic territories and communities. Of our 71 filled staff and 22 AmeriCorps positions, we are 65 percent female and 35 percent male. Our demographic profile is: 7 percent Asian; 13 percent Black (including African and African-American); 32 percent Latino; and 44 percent White. When we look at the leadership layer in the region, this diversity is maintained (except for a continuing under-representation of Asian-Americans), including executive directors, the senior leadership team has 5 White, 5 Latino and 2 African/African-American members. Composed of 36 members, the LA Regional Board has grown in diversity in the last four years. 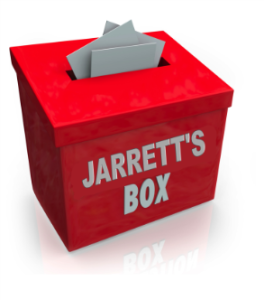 In 2014, the board was 88 percent non-Latino white and 12 percent Asian/Asian-American. Today, our board is 68 percent non-Latino white, 18% Asian/Asian-American, 8 percent African/African-American and 8 percent Latino. 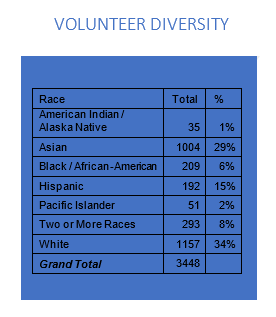 Volunteers are also diverse, though not a “match” to the region’s demographics. We have fewer volunteers in the T5 region and more in the T3 and T4 regions. A quick snapshot of our race/ethnicity profile is visible here, to the right. Researching the diverse cultural traditions, practices, and beliefs that make up the Los Angeles Region and working with Red Cross staff to reflect them in Red Cross events and activities. Acting as an information resource hub, and collecting and disseminating resources and feedback to/from staff and volunteers. Chair the Diversity, Equity and Inclusion Committee for the Los Angeles Region. Quarterback full implementation of current and future goals of the Committee. Act as a resource to staff, volunteers and the community in efforts to support and extend work promoting diversity, equity and inclusion. Monitor the function of the Los Angeles Region’s diversity, equity, and inclusion efforts. The chair of the Diversity, Equity and Inclusion Committee will lead the effort to continue engaging teams in the Region to achieve these goals—including, for example, new goals that may emerge with the data garnered in Goal 1. All said, I believe tracking progress toward a more representative staff and volunteer team, when compared to regional demographic data, is very much achievable. In the spirit of “what gets measured, gets done,” it is our strong hope that all Los Angeles area Redcrossers jump onboard in support of a more diverse, equitable and inclusive American Red Cross.